As a HUD 203k consultant, I keep getting calls from people, needing a 203k consultant but it’s at a time of either the client already has a lender and contractor or the client was told by the lender that they need a 203k consultant once their contractor quote comes in. Once I explain to the client what my role in this process, things become clearer. In order to navigate through this process, most customers wants to know what is a 203k Rehab Loan? 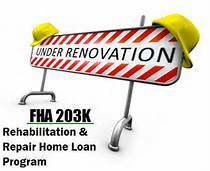 A 203k loan is an FHA Loan that allows you to purchase a home that needs renovations or just some updating and get one loan that includes funds for the purchase AND all rehab costs, inspections fees and even 6 month’s carrying costs. HUD does realize that most people cannot afford 2 mortgage payments or paying rent and a mortgage payment while you wait for the work to be completed. HUD allows you to include up to 6 months of your mortgage payments in your loan so you do NOT have to pay your mortgage out of pocket for the first six months. Below is the process in getting your 203k loans from initial process to the completion of your project. If feasible, Client signs Consultant Agreement and pays the Consultant “Feasibility Study” fee. If the Contractor is already selected, the Consultant meets with the Contractor to discuss the overall project, project expectations and document preparations and submittals. The Borrower selects a contractor. Borrowers should be aware that many lenders may have contractor qualification criteria. Some lenders maintain a list of contractors that have met their qualification criteria. Discuss contractor selection with your lender to learn about their contractor requirements. If you’re considering a contractor which has not yet been approved by your lender or has never done a 203(k), it is important that they are informed early on about the 203(k) concepts as it applies to contractors. The Consultant then meets with the Contractor to discuss the overall project, project expectations and document preparations and submittals. This process will work with a “Fannie Mae Homestyle Loan”, more information on that process will coming in my next blog. Your loan process should be as clean as possible and my job as a HUD 203k consultant is to be sure to keep it that way.